An average shipping container measures 40 feet long by eight feet wide by eight feet tall, or 320 square feet. Twenty foot long containers are also available, as well as other specialty sizes. Like Legos, they can be stacked on top of each other or side by side. Used containers are readily available—an estimated 700,000 at any given time—and you can expect to pay between $1,000 to $2,000 for a good quality container. 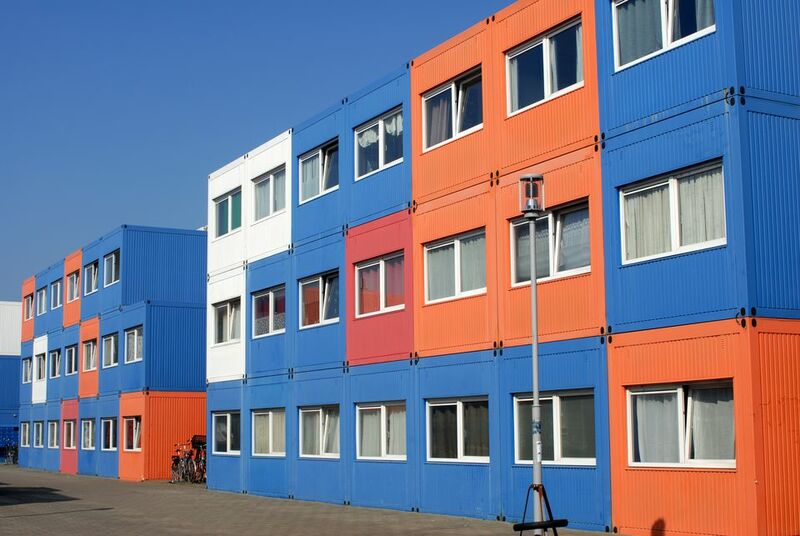 Shipping containers were built to be durable. They are structurally sound and their Corten exteriors are fire and rust resistant. These units are ideal for regions prone to hurricanes, tornadoes or earthquakes. Another benefit is that shipping container additions, unlike the rest of your home, are portable should you decide to move. Flexible modules allow you to create additions for such uses as a family room, office, playroom, guest room, exercise room, art studio, workshop or pool cabana. Although shipping container additions can be erected much faster than your typical home addition, there is still some prep work involved. First, you must obtain a building permit; check with your local building department. You must also pour a concrete foundation on which the container will rest. The container will be delivered by truck and situated onsite by a forklift, or in extreme cases, a crane or helicopter. Now you are ready to convert the container into a viable addition to your home. Cut openings for windows and doors. Incorporate wires and pipes for electricity, plumbing, and HVAC beneath a raised floor or within furred-out interior walls. Exterior walls should be insulated, either from the exterior or interior surface of the container. Leave the corrugated surface of the container visible from one side, or if the industrial/modern look isn't your thing, clad the walls with just about any traditional material to match your existing home or to reflect another style. In order to attach a shipping container to your existing home, considerable demolition work will be involved as well as potentially complex roofing issues. Unless you are very experienced with such tasks, it is advisable to hire a contractor. Rather than tying in with your existing home, you may choose to connect your container addition via covered walkway if you live in a temperate climate or opt for a "freestanding addition" for certain uses, such as a pool cabana or guest house. If buying a shipping container, transporting it to your property and converting it to livable space sounds overwhelming, you'll be glad to hear that there are several options for ordering prefabricated shipping container home additions. Expect to pay around $100 per square foot for a finished unit (excluding electrical, plumbing, and HVAC), a price that is competitive with or cheaper than traditional building methods. Architect Adam Kalkin designed The Quik House, a prefabricated container house kit. Although the standard set up is the size of a full home—2,000 square feet including three bedrooms and two and one-half baths—the kit can be customized depending on your needs. The shell assembles in one day onsite and the structure can be completed within three months. New Zealand-based Atelier Workshop's version, the Port-a-Bach, is touted as a holiday home but its design is very flexible. This container can be connected to municipal services, though it is designed to be "power, water, and sewer independent." You'll forget that it's a shipping container with built-in millwork, a stainless steel kitchen and bathroom complete with composting toilet. Cutting edge NYC architecture firm LOT-EK developed a Container Home Kit (CHK) that is easily adaptable to existing conditions. Based on the container's module, choose from configurations with 640 square feet up to 2,560 square feet. Not only is electrical, plumbing and HVAC taken care of, these units also contain built-in closets and wood floors. If you prefer for someone to hold your hand through the entire process, SG Blocks provides architectural and engineering services and assists in selecting a builder and obtaining permits and provides project management. You may choose the "finish" level of your container addition, from a container with empty window and door openings to a fully modular system that is nearly ready to occupy.